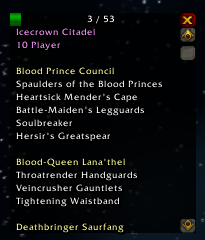 This is a simple addon that lists your missing appearances categorized by instances they come from. Any donation is highly appreciated. This addon is wery good but it would be exellent if it also provided the trash loots appearences we dont have!!! A friendly suggestion! :) Thank you! Love this addon, good job. First of all I just want to say I love this addon. When playing my priest it shows mage and warlock gear under some tiers which are impossible for me to unlock. Tier 4,5 and 6 seem to be the only tiers with strictly priest gear. 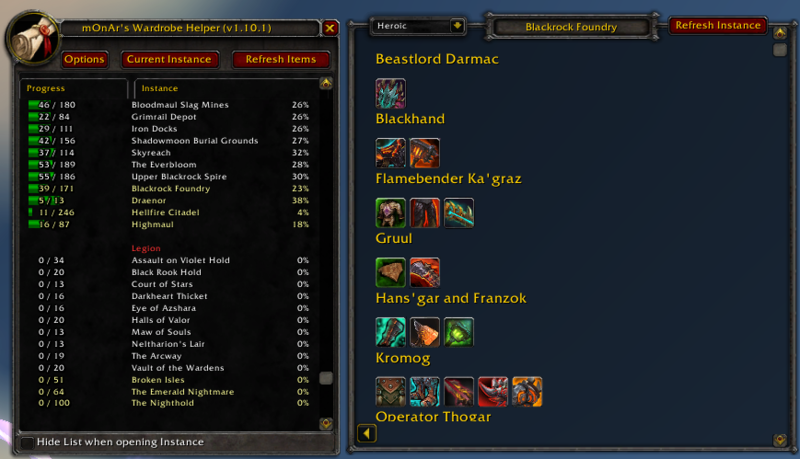 are you sure its not showing pieces that share the same model as the warlock or mage tiers? I'm positive. For T1 it shows mage helm. Hey, i found this addon Instance Portals, would there be any chance to make some add to it from your addon, that when you press one of the Marks on the map with like SHIFT + Click it then opens your addon with that instance ? Is Raid Finder difficulty gonna be added? does this addon show the current instance that you are runnin? Please, sort bosslist in in instances/raids. Close to impossible with current implementation without huge changes. RU-Localization: raid "The Eye" is called "Крепость Бурь", not "Око". Please change to the correct name. Do you mean to categorize items in Vendor category the same way they are categorized by bosses in other categories, but by vendor names?